We got talking the other day about all the meals we've had during our short stint together. "Well, I'm not really too keen on them salads", admitted The Boy Next Door, "like that minty pea risotto". Yeah, that's how well he knows his stuff (for the record: I love that risotto). But I suppose it does say something about how often salads make an appearance at our kitchen table. I mean, I've got nothing against them per se, but just think about all those salad buffets. Tasteless iceberg lettuce, a couple of watery cucumber slices and tinned corn - that does not a happy diner maketh. And that's exactly what food is supposed to do. So, when we do have salads, they tend to be a lot more robust. Either pasta-based (like this perennial favourite: St.Tropez chicken salad) or with potatos (just check this smoked trout salad out! Or this Spanish seafood salad! Or this summery potato salad with marinated octopus!) And lets face it: bacon makes everything better as this German potato salad proves. If we have like a leafy salady salad, then it's got to have at least duck confit(!) in it! 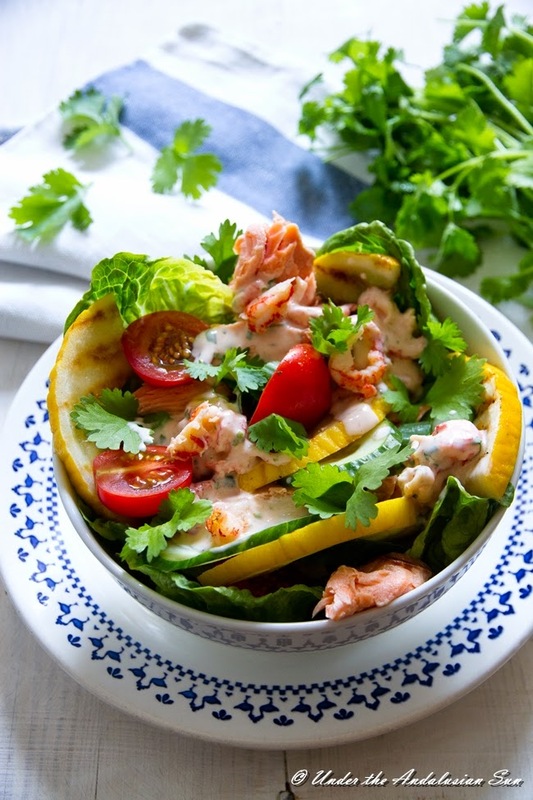 This sturdy salad, perfect for the ongoing crayfish season, was made up of smoked salmon, cucumber, tomato, grilled melon and sweet and spicy cray fish dressing. And coriander, of course - lots of it. Grilling melon (like any fruit) really emphasizes the natural sweetness of the fruit, accompanied with lovely charred kick. But melons, like any fruit with high water content, tend to go soggy the longer they wait, so only grill the melon if you're going to be serving the salad straight away. Slice the cucumber and halve the cherry tomatos. Cut the melon in half, remove the seeds and cut into 1 cm slices. Grill on a hot grill. Assemble the salad and serve with crayfish dressing. Combine the ingredients, check taste and adjust with more salt or sugar if needed. ¡ Viva el Kräftskiva !